King Crimson has one of the most interesting and complicated histories in all of progressive rock. The lineup is one of the most dynamic, too. I'd have to say that for my money this lineup is the best ever. That lineup is composed of Mel Collins (saxes and flute), Robert Fripp (guitar and keyboards), Gavin Harrison (drums), Jakko Jakszyk (guitar and vocals), Tony Levin (Basses, Chapman stick, vocals), Pat Mastelotto ( drums, Bill Rieflin (keyboards) and Jeremy Stacey (drums and keyboards). While there have been so many different sounds in King Crimson's repertoire over the years, this might be the lineup capable of capturing all those textures and sounds. It allows for an experience that cuts through the history of the band and makes it work. I had thought about going to this exact show, but ultimately didn't. If the opportunity comes again, I don't plan to miss it. This is amazing stuff. Even the hardcover book styled CD case and booklet are nothing but class. I can't recommend this set enough. This literally is a lot of crowd noise followed by bells and then some bits of spoken voices before the sounds of tuning up. Tuned percussion type sounds (electronic drums?) open this classic Crimson cut. The guitar eventually rises up to bring this into being with the familiar dark and fierce power. It explodes out from there and we're into the jam full-throttle. This is on fire. They work through a number of changes. Parts of this seem pretty close to the original version with which we are all familiar. Other sections seem to deviate quite a bit. It's all just plain incredible. They drop it later in the track for a cool flute solo thing. It takes on some familiar melodies during that section. They bring it back out into the type of thing you expect from this piece, but with some different angles. It's a powerhouse. Tony Levin brings this thing in with a smoking hot bass line. They work out from there with some screaming hot jamming. Saxophone wails over the top. This is quintessential King Crimson, merging the old school with the modern. A circulation section takes over for the entry of the vocals. They keep moving forward in style from there. While this is a bit more straightforward and mainstream, it is King Crimson, so it's only so much so. This is high energy, rocking and quite cool. The saxophone adds a lot, but if you really listen, everyone is playing like crazy. The left turn instrumental section later in the piece, with a powerhouse percussive element is a classy diversion. It doesn't stay around long, though. This older King Crimson song is a surprise for me. They really manage to create the sound from those days, but bring a bit of a modern edge to it. The contrast between mellower and more rocking stuff is great. This is so classy and powerful. I've never been a big fan of this song, but this live rendition has convinced me. There is some exceptional jamming built into the later parts of this with the saxophone really wailing over a particularly intense musical passage. Speaking of surprises, I am shocked to find this suite in the set-list. It starts mellow and works upward gradually from there. Again, this is an old-school Crimson piece, and it's tied in texture to that era. That first section runs through until around the two and a half minute mark when it powers out to hard-edged King Crimson jamming that is so classic in tone. This jam works through some pretty killer territory. It drops way down after the six and a half minute mark (this is almost eleven and a half minutes long) and grows back out from there with a rather freeform jazz kind of vibe. Then it explodes back out around the seven and a half minute mark. Red is probably my favorite King Crimson album. So, I love this song. I think I prefer the studio version just because of the tone, but this comes very close. I mean, it's just a matter of degrees, really. The powerful prog stylings of this cut are captured quite well in this live take. The second part of the Larks' Tongues cut fires in with fury and power. It work through the familiar changes in style with this live telling. The horn soloing section later in the piece is a real powerhouse jam. Another cut that's much older, this starts with just piano and voice and works gradually forward from there. The horn work on this cut is so pretty. The track is one that remains quite mellow throughout. It's arguably the most mainstream cut here, feeling very much like a contemporary jazz kind of piece. Mind you, this cut is very long, which takes it out of the mainstream. It's a real treat, though. The sounds of bells chiming starts this. Birds take over from there. They take it out from there into a killer hard rocking Crimson jam. This is a powerhouse. There is a lot of jazz built into this along with the kind of sound one associates with the heavier side of early King Crimson. Of course, it comes from that era, so it makes sense. They cover a lot of musical ground on this one before bringing it back out to the hard rocking end of the spectrum to close it. Coming in heavy and loud, there is a tentative kind of vibe to this nonetheless. It features some killer drumming between the bursts of sound. It explodes out as it approaches the four minute mark into some powerhouse jamming. It drops to an almost jazzy arrangement for the vocals. I have to say that while I like the vocals on this, I miss Adrian Belew. It's a huge change and a completely different approach. These vocals are more sung while Belew's were more spoken. I just prefer the other one. Still, this is a great tune in either configuration. The rubbery bass sounds on this are amazing. The guitar circulation stylings are great, too. This whole piece just oozes cool, really. It shifts this way and that and always manages to work. This thing has some many cool sections. It's a particularly successful instrumental with a lot of flavors. Another of my Crimson favorites, they put in a great live version of this. Jakszyk really approximates John Wetton's vocals on this. The whole piece just works quite well here. They capture the jazzy mellower stuff along with the harder rocking in style. There is a bit of a modernization while preserving so much of the original flavor. They wander into spacey texture mid-track. They add some other things onto the skeleton of the track, breathing new life into it. This is quite an intriguing exploration. It has some decidedly jazz-like stuff, particularly in some of the mellower movements. It does a great job of merging old King Crimson sounds with newer textures. It has some powerfully bombastic stuff counter-pointed with particularly mellow stuff. Bass and other textures serve as the backdrop here as flute dances around over the top. They bring this in with a killer King Crimson jam. The vocals are set in a more rocking style. This is a powerhouse tune that's trademark Crimson. This is pretty mainstream and straightforward, but it's also KC, so you know that's only so true. There are some great layers of sound that emerge over the top as this continues to make its way forward. 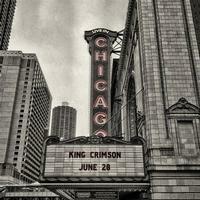 This instrumental lands on this heavy, pounding side of King Crimson music. It's a driving powerhouse. The flute over the top is a cool touch. This first half of this is in a similar vein to the previous number. They drop it for a weird percussion based bit. Then it turns to a section that's almost King Crimson goes techno. They alternate between those two concepts from there. By around the four minute mark it has shifted back to the hard-edged King Crimson stomping mode. This gets into some pretty amazing stuff before it ends. This is my all-time favorite King Crimson song. I'd say that it is probably what I'd consider to be the quintessential progressive rock piece. They do a great job of capturing the magic of the original studio version. The cut is a dynamic powerhouse in its studio incarnation and they put in a fairly faithful live rendition. It really just works so well here. Here Crimson puts in a live rendition of their version of the David Bowie classic. It's a fun, mainstream rocker with Crimson touches. I like this live version better than the takes on the EP released recently. This is on fire. They put in a purely fierce and fiery live take on this King Crimson classic. It's a great way to end things in style. They turn it out into a cool freeform jazz meets space music section mid-track and continue to jam from there. There is a percussion solo later in the track, too. It has both drums and tuned percussion and is fairly extensive. They bring it back out to the song proper for a killer closing section.